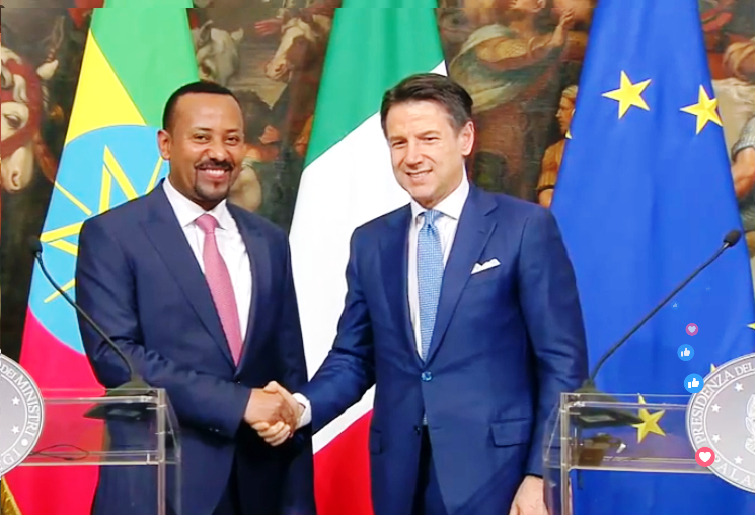 “We are excited and accept with great honour Italia’s plan to extend support our plan to link Addis Ababa with Massawa via railway,” Prime Minister of Ethiopia, Abiy Ahmed said. Speaking after meeting Prime Minister of Italy Guiseppe Conte during an official visit to Rome, Abiy Ahmed said that financing the 736-km railway line would be the first step to a crucial route for trade between the two countries. The Prime Minister also called for enhanced cooperation between Ethiopia and Italy in the areas of development, peace, and tourism. He also expressed his government’s plan to extend support to the soldiers returning from the Ethiopia-Eritrea border following the peace agreement between the two east African neighbours. Support in projects to tackle food insecurity of school-aged children was also agreed, building on Italy’s long term commitment to development cooperation. Italy has had an extensive relationship with Ethiopia in the recent past. Most of Ethiopia’s hydro-power dams including the US $6bn Great Ethiopian Renaissance Dam under construction, are built by the Italian company, Salini Impregilo.